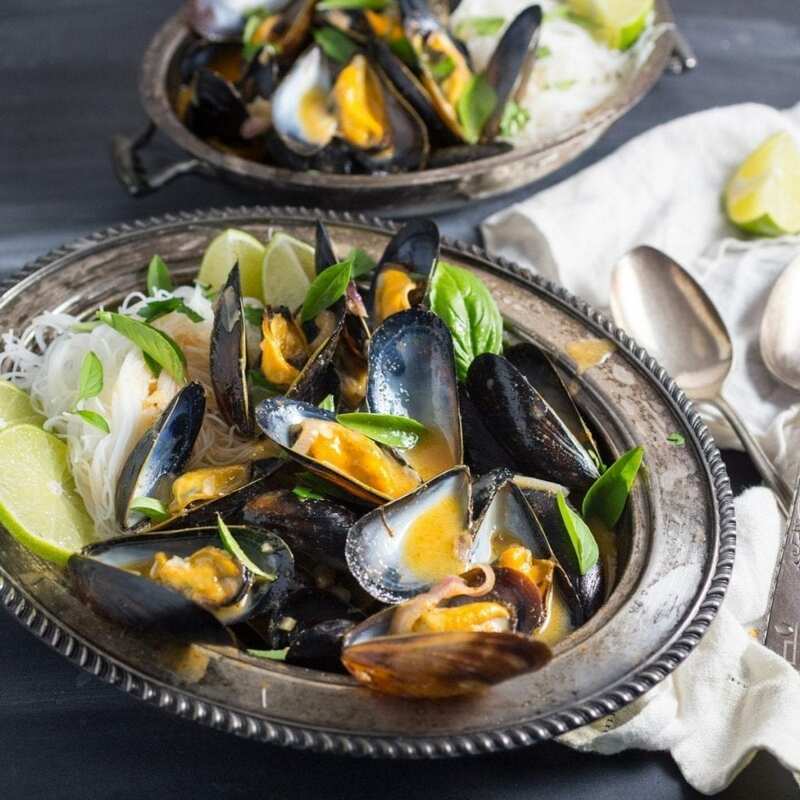 We spiced up our one-pot mussels with Thai curry sauce to make this red curry mussels recipe. It’s cheap, it’s delicious, and best of all, it’s ready in 20 minutes! Note: you can also find this recipe on Serious Eats! Mussels are perhaps not everyone’s first choice for a quick weeknight supper, but that assessment deserves to be challenged. 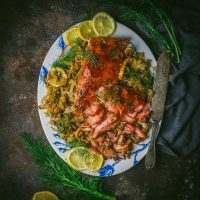 They cook quickly and excel in simple recipes like this one. Most people have probably made a variation on moules à la provençale (mussels in a garlic-tomato sauce) or moules marinières (with white wine and butter). Today we’re using a Thai-style red curry paste and a quick vegetable sauté to create a bold, spicy broth that pairs perfectly with briny mussels. Add some easy rice stick noodles and you’ve got a complete meal on your hands in 20 minutes or less. Fresh mussels cook in minutes which makes them perfect for quick meals. Here in the northeastern US, one of the best varieties of mussel hails from Prince Edward Island, just off Nova Scotia in Canada. 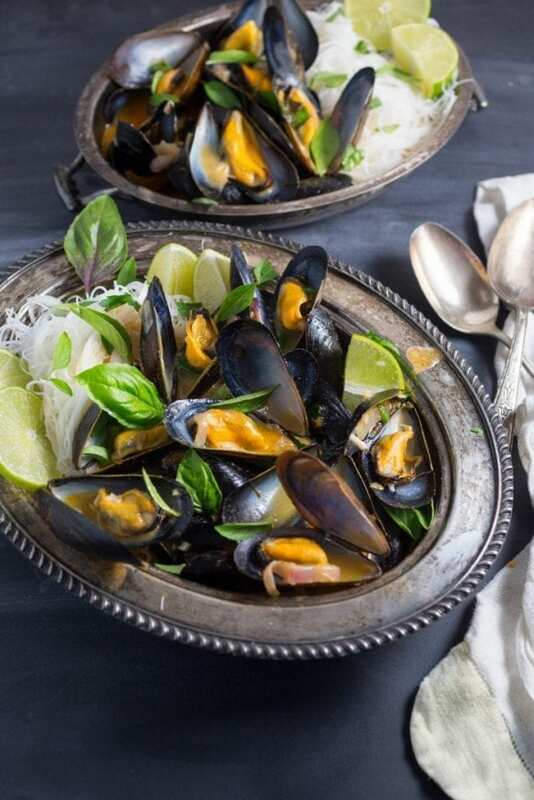 Like most mussels available in North America, they are farmed rather than caught in the wild, which, according to Seafood Watch, makes them one of the most sustainably produced seafoods you can buy. As with any seafood, you do need to find a supplier that you trust to provide you with fresh, high-quality product. A good retailer will let you do the sniff test—like other fresh fish, fresh mussels should have only a faint odor. 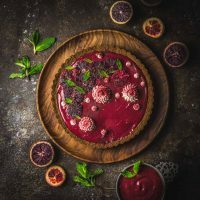 You should, of course, keep them cold, but not frozen, and cook them within a day or two—our preference is to set them in the fridge over ice, or underneath a zipper-lock bag packed with ice. If they’re in a plastic bag, make sure to keep it open for air. Because they steam very quickly, you should prep them and keep them in the fridge while you get your noodles ready and prepare your base sauce. 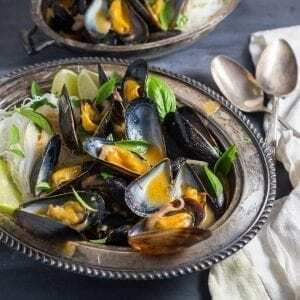 You may not need to do much work at all to clean the mussels—a light scrub might be required, and you’ll want to pull out any beards you see (this may not be too much of a problem with farmed mussels). Tap any mussels that are ajar to see if they can be coaxed closed; if not, they should be discarded. Once they’re back on ice, make the noodles. We chose thin rice vermicelli for this recipe—they cook through quickly just by sitting in hot water while you make the rest of the dish, and you won’t need to use the stove. Of course, you can warm up a baguette if you’d prefer bread to mop up the broth, but the noodles seem like a more natural pairing for the Southeast Asian flavors we’re using here for curry mussels. The only real work you’ll have to do is construct the curry broth. To start, we heat up some oil in a skillet and sauté some garlic and shallots before adding a dollop of red curry paste. You can typically find curry paste in canned or jarred form in your grocery store. 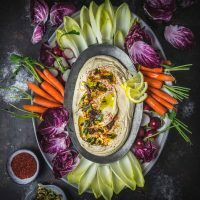 Different pastes can provide more or less spicy heat and salt, so if you’re trying a new paste, it’s wise to start with one or two tablespoons, taste, then add more if you like. Once the red curry paste has bloomed in the oil (this helps develop its flavor), we hit it with a splash of alcohol. Adding a Western booze like wine or beer may sound strange for a curry-flavored broth, but we love the flavor it brings. 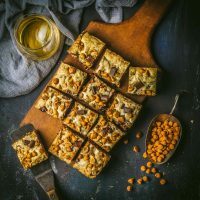 We’ve tried both white wine and Bengian-style wheat beer in this recipe — feel free to experiment, and you probably can’t go too wrong; whatever you have open will work. If using beer, avoid anything too heavy, like a porter or stout. For wine, a dry white is what you want, and don’t worry about breaking the bank. Anything you’d drink with dinner will work in the dish. We often eat mussels straight out of the pot but this time opted for fancy silver bowls. Next, we add coconut milk, fish sauce, lime juice, and a little sugar to balance out the heat of the curry paste. Then we add the mussels and cover the pot—they should open up within a few minutes, with just a couple of stirs now and then. By the way, you can ignore the old tip of discarding unopened clams or mussels: Studies have shown that they are perfectly safe to pry open and eat. Finally, we stir some cilantro and basil into the curry mussels, adding them at the last minute so that their flavors stay bright and fresh. If cilantro’s not your thing, any mix of fresh soft herbs would be great. Parsley and mint are good options. Scoop the mussels and broth over noodles in individual bowls, and make sure you serve them with an empty bowl for the discarded shells! You’ll want spoons to get at the last of the delicious broth. Briny, sweet mussels in a spicy Thai red curry broth. Served with rice noodles to make a quick and delicious meal.